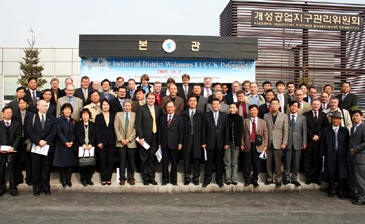 The European Union Chamber of Commerce in Korea (EUCCK) hosted a one-day business tour of Gaesung Industrial Zone in North Korea for foreign businessmen and European Embassies based in Seoul Nov. 2, 2005. This industrial tour was organised due to continuous demand from EUCCK members to visit Gaesung and was made possible thanks to the efforts of the Korean Government. The 70 guests on this tour came from various European organisations such as embassies and companies. The EUCCK business delegations left from Seoul at 7:30 a.m. and arrived at Gaesung industrial zone at 10:20 a.m., they had a meeting with the Gaesung Promotion Committee and briefed on the "current business environment for investment in the zone," Some companies were already active here and toured Korea Land Corporation's Gaesung tower to see future development plans. EUCCK participants in this tour showed great interest in the Gaesung complex and asked several questions related to investment procedures during their day long visit. It is the first time for a foreigner's delegation to visit the Gaesung Industrial Zone coming from Seoul. Mr. Jean-Jacques Grauhar, Secretary General of EUCCK mentioned that "this tour will be an excellent opportunity to improve business development between the two Koreas and Europe." The European Union Chamber of Commerce in Korea (http://www.eucck.org, Chairman Frans Hampsink ) is organized by embassies and business organisations from European nations in Korea and current membership is over 800. The main role of the EUCCK is trade facilitation, industrial cooperation, investment promotion etc. and it is the major window of trade and business cooperation between the EU and Korea.